A family day at the beach is an occasion I look forward to every summer, but the thought of hauling a day’s worth of supplies across the sand and back is exhausting. Lugging your bags, towels, chairs, beach toys, eski and boogie boards across the sand all while holding a toddler who refuses to walk, is simply no fun. Fret no more, because we’ve found a fabulous way to tote all your beach essentials plus your children in the most effortless way possible. The Beach Cart by The Beach People is the perfect carry all beach essential. Durable and sturdy, the cart is made from wood and steel with a loading capacity of 150 kilograms. Whether you’re walking the shores or setting up your beach shelter for the day, the cart will make your trip to the beach blissful, relaxing and trouble free. 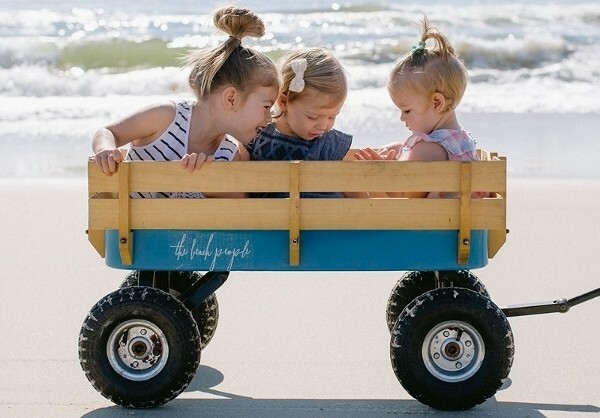 A ride in the beach cart will be your child’s new favourite way to travel, it might even mean you can enjoy a daily walk along the beach (Ah, sounds divine). Available online from Hunters and Gatherers for $245.